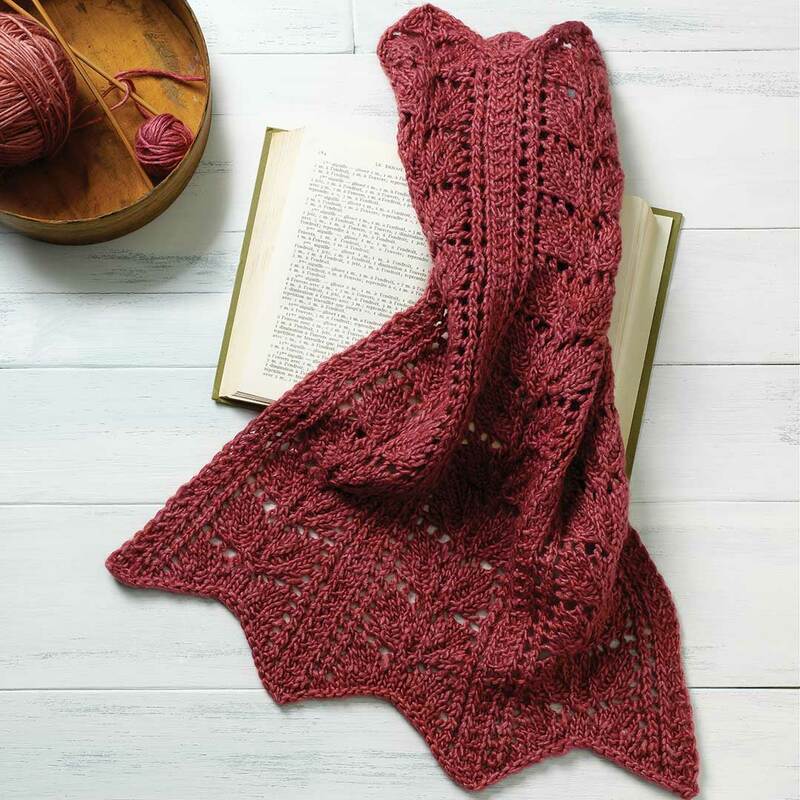 The Double Rose-Leaf pattern featured in the second series of Weldon’s Practical Knitter (Volume 1 of Weldon’s contains the first four series of knitting patterns) is quite versatile. As the introduction to the pattern suggests, you can knit it with wool or cotton yarn for “couvrepieds, antimacassars, curtains, and various other purposes.” A couvrepied is a quilt or bedspread and an antimacassar is a doily or cloth usually placed on the back of a chair to protect it from the Macassar oil men used on their hair. 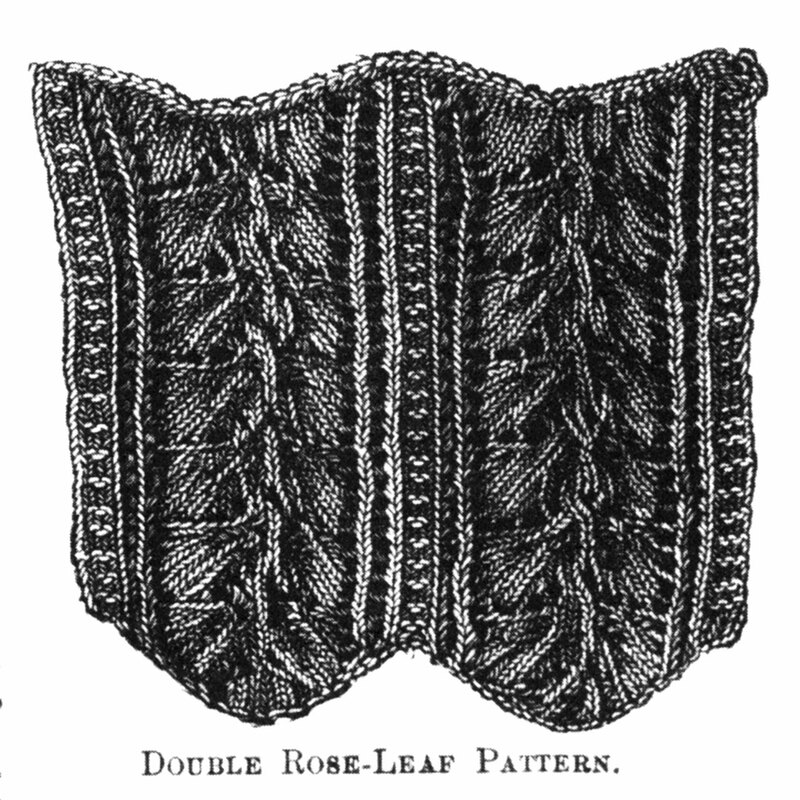 The Double Rose-Leaf pattern featured in the second series of Weldon’s Practical Knitter. Carol Huebscher Rhoades previously knitted the Double Rose-Leaf pattern with fine cotton yarn on very small needles for a lace pillowcase edging. For this project, it’s the beginning of a lovely, cozy scarf. Photo by Joe Coca. I have previously knitted the Double Rose-Leaf pattern with fine cotton yarn on very small needles for a lace pillowcase edging. With the sample’s DK weight yarn, I quickly envisioned a lovely, cozy scarf. The illustration of the Double Rose-Leaf Pattern from Volume 1 of Weldon’s Practical Needlework. The pattern repeat is a multiple of 21 + 4 stitches, and I cable cast on 67 stitches for three repeats plus the edge stitches. I followed the pattern instructions as is for a total of twelve repeats in length, ending with a loose bind-off. I slipped the first stitch purlwise with yarn in front on each row and, combined with a knit stitch at the end of every row, it made an attractive chain edging. One term to note: “make 1” here refers to a yarnover, not a lifted strand increase between stitches. The sample used all but 9 yards (8.2 m) of the skein. 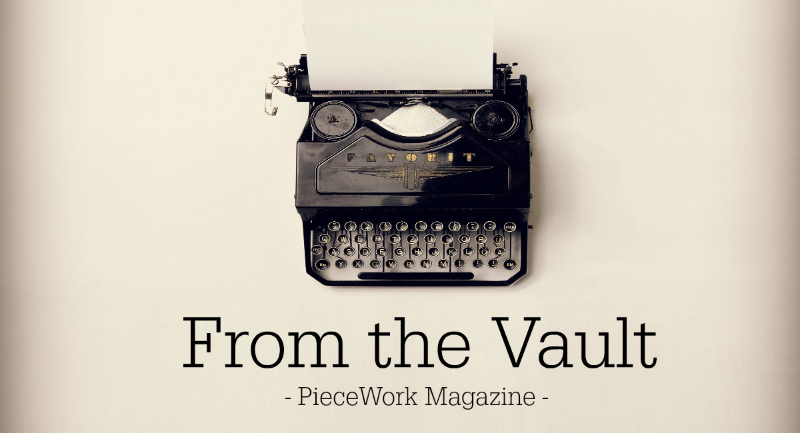 Carol Rhoades enjoys knitting and crocheting Victorian and contemporary designs. She often teaches workshops on various aspects of nineteenth- and twentieth-century traditional knitting and crochet from the United Kingdom and Scandinavia. 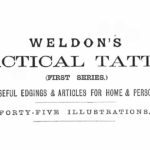 Discover the world of Weldon’s!